As is usual for books from the Genevieve series, this is a collection of several novellas. Although I continue to find Genevieve as a character interesting, the re-spins on old tales are getting tired. The first story, Red Thirst, was an interesting story dealing with the befriending of a vampire under inconvenient circumstances. The second story, No Gold in the Grey Mountains, was more interesting, as Genevieve was "under cover" playing along with bandits. In The Ignorant Armies, the eternal battle ground was a great vignette. The Warhawk was a mediocre tale of a villain's genesis. The Ibby the Fish Factor was the best story of the lot, with a nice twist on how vampires could deal with a zealot trying to wipe them out, prepared to die for the cause. I could go back to this world again and again. It isn't really the Warhammer World of the game, with it's eternal miserable darkness, but instead that of WFRP - grimey and medieval but with a hell of a lot of fun humour in it. Yeovil/Newman never takes his settings or work too seriously, and that's a pleasant change from the traditional grimdark of the Warhammer World. I'd cheerily read more Genevieve novels, alas they'll never exist now. Just like the other Vampire Genevieve novels set in the Warhammer Universe that Kim Newman (under the pen name Jack Yeovil) wrote, this one plays with genre conventions, and the conventions of other genres, to make for an entertaining read. Not really a novel so much as a collection of stories, it fills some of the background for stuff alluded to in the previous three books. Read as part of The Vampire Genevieve omnibus. 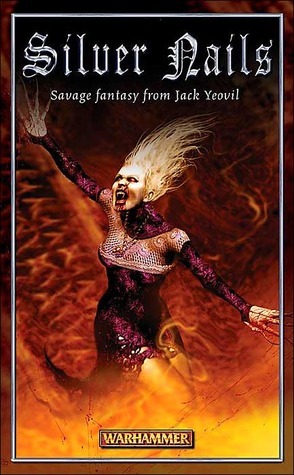 Jack Yeovil - "Jack Yeovil" is a pseudonym used by author Kim Newman.Newman's pseudonymous novels, as Jack Yeovil, play elegant games with genre cliche--perhaps the best of these is the sword-and-sorcery novel Drachenfels which takes the prescribed formulae of the games company to whose bible it was written and make them over entirely into a Kim Newman novel.